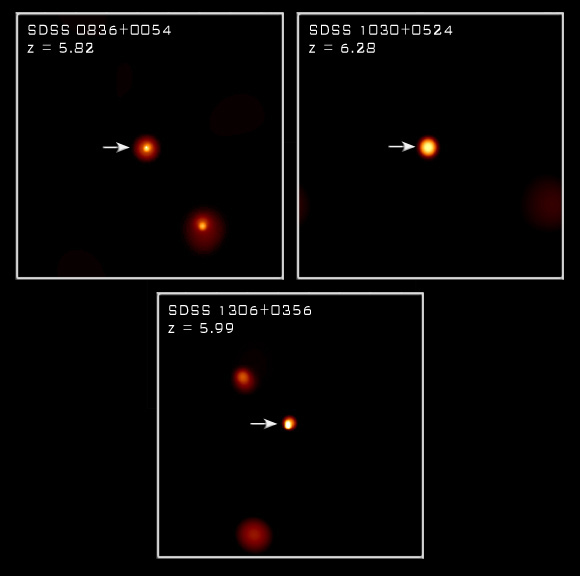 These three quasars, recently discovered at optical wavelengths by the Sloan Digital Sky Survey, are 13 billion light years from Earth, making them the most distant known quasars. The X-rays Chandra detected were emitted when the universe was only a billion years old, about 7 percent of the present age of the universe. A surprising result was that the power output and other properties of these quasars are similar to less distant quasars. This indicates that the conditions around these quasars' central supermassive black holes must also be similar, contrary to some theoretical expectations. As astronomer Smita Mathur of Ohio State, who was involved in the research said, "Perhaps the most remarkable thing about them is that they are so absolutely unremarkable." By various estimates, the supermassive black holes in these quasars weighed in at somewhere between one and 10 billion times the mass of the Sun. The implication is that the black holes put on a lot of weight soon after the galaxies formed. 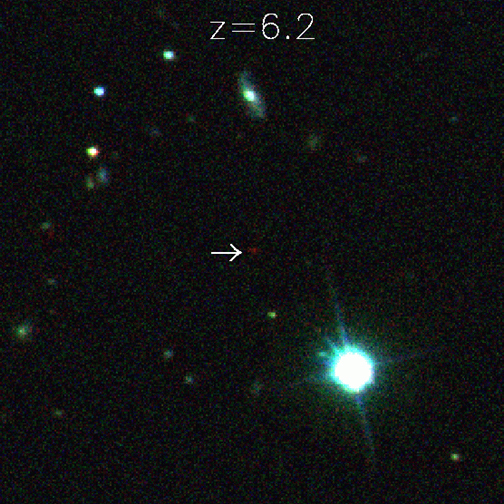 Scale Image is 1.61 arcmin on a side. Coordinates (J2000) RA 8h 36m 43.9s | Dec +00° 54' 55.10"
Coordinates (J2000) RA 10h 30m 27.1s | Dec +05° 24' 55.10"
Coordinates (J2000) RA 13h 06m 08.3s | Dec +03° 56' 26.30"